Image by Bill Lile on Flickr. Gerry Moran is Head of Social Media Marketing for SAP in North America, where he leads social demand generation, channel management, social intelligence and social selling strategy. He also runs the social media coaching blog, MarketingThink.com, where you can see the original post. 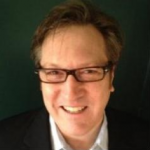 Gerry Moran is Head of Social Media Marketing for SAP in North America and is a contributor for the HootSuite Blog. Social selling opportunities are flying toward you and past you as if you were the Starship Enterprise in the middle of an asteroid storm! 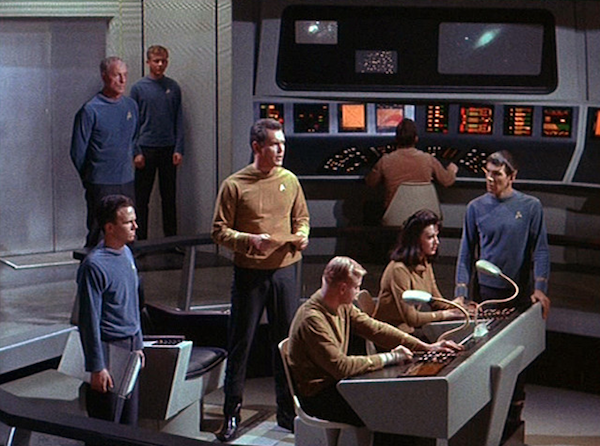 If Lt. Uhura was not staffing the Enterprise’s command center, then Captain Kirk and his crew could never have survived their first season in 1966! However, with Uhura attending to a set of screens containing streams and feeds of information the Enterprise crew prospered. They were able to follow and communicate with their friends, foes, planets and understand their ship’s performance data! A similar command center for your social selling activity can help you survive and thrive! It’s important for you to have a command center so you can have all of your social communication “dials and buttons” in one place. With everything you need to communicate at your fingertips you can spend more time with strategic account development and being in front of your customers! 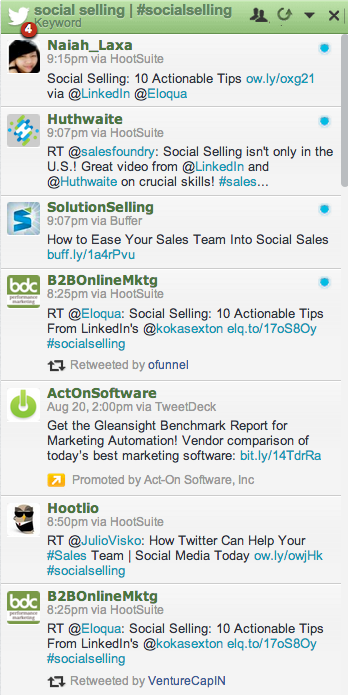 I use HootSuite, after a few years of trial and error testing, as MY social selling command center. There are other tools, so you will need to pick one that is comfortable for you. You will need to build out these five screens to help you navigate and respond to the many sales opportunities flooding in via Twitter, LinkedIn, blogging and other social media channels. Listen For Key Selling Triggers. Set up a stream to listen for key sales triggers. This action will give you real-time data on what’s being said about your discrete and multiple streams of relevant information, like Big Data and Cloud Computing. You can even track messages and streams based on Boolean (sounds like Romulans, but trust me Booleans are our friends) searches like Analytics + CMOs. 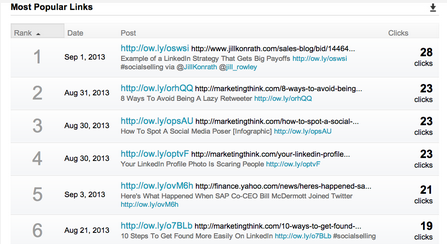 Sample of a Boolean search stream on HootSuite. Observe Social Media Activity Of Key Contacts, Media Publications and Relevant Social Media Channels. Devise a stream for your command center that shows you all the social media messaging of your customers, completion, thought leaders and media publications. You can have all of your key contacts in one stream, or add streams to cover separate customer, competition, thought leaders and media publications. 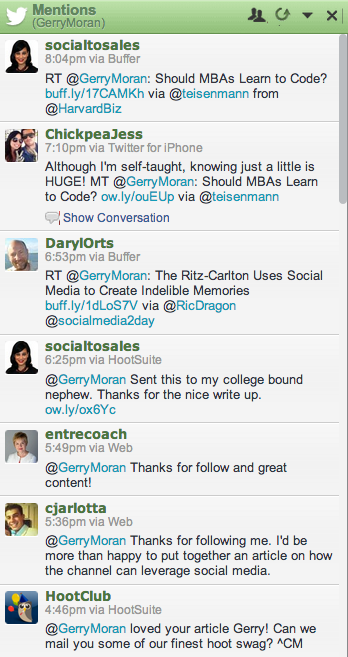 Stream of key contacts followed with HootSuite. Message And Respond To Your Contacts. From your command center screen use a stream of your contacts or listed people to direct message (i.e., like an email for Twitter) your customers to start or respond in a private conversation, to reach out to non-followers with a Twitter mention to engage in a public or semi-private conversation, or to reply to any message that is directed to you. This is the part where Lt. Uhura used that ear-thing she was always holding! 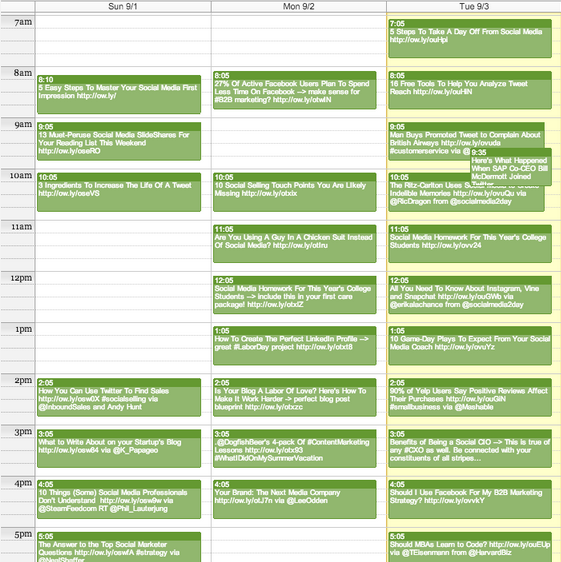 Schedule Your Content. Regular content creation, curation, and deployment are the dilithium (that’s the Enterprise’s fuel) to your personal branding engine! A command center, like HootSuite, will let you schedule messaging so you can ration your “content fuel” over time for better performance. Screen shot of how your messages can be scheduled. Measure The Performance Of Your Messaging. We always need to be measuring performance. When Captain Kirk hears from Spock that the deflector shields are at 10%, he is going to operate a little differently than if this protective shield is at 100%. The same goes with your social selling command center. If your content and social selling messaging activity is working, then you want to do more of it. When it’s not working you need to change it. However, if you are not able to measure your work, then you cannot make these changes. Your social selling command center can help you easily make that decision since that measurement data is just a click away. Do you have a story to share about your command center? If so, please beam it over! Or, contact me directly at MarketingThink.com or on Twitter. So, before you fire off errant tweets and use several tools to do different types of listening and engaging, power up your personal social selling command center to save you time and increase your chance for success. With this extra time, you can focus on the important things with your social selling strategy! Live long and prosper! Social Selling is one of the many business solutions offered by HootSuite Enterprise. To learn more about how our advanced offering can map to your organization’s needs, request a customized demo today.